Proton therapy has become the most precise and advanced form of radiation treatment. 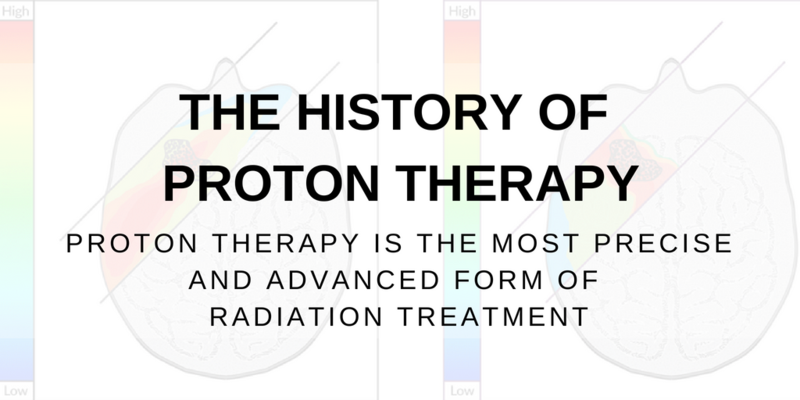 The field of radiation oncology has made significant strides since practitioners began using photon radiation therapy around the turn of the 20th century. Not until the 1950s, though, did researchers begin to recognize the full potential of isolating protons for the treatment of medical conditions. Advanced theoretical understanding of particle acceleration, proton beams, and their applied use in radiation treatment has improved outcomes for patients of many types of cancers. The cyclotron, a type of particle accelerator, was first conceived by Ernest Lawrence in 1929. It was built at Berkley Radiation Laboratory at the University of California, Berkley. This initial research was focused not on the treatment of human malignancies, but on the discovery and exploration of particles and nuclear physics. In 1946, a Harvard particle physicist, Robert R. Wilson, proposed using proton beams for medical application. During his work collaborating with a team on the design of the Harvard Cyclotron Laboratory (HCL), he outlined the possible clinical applications of protons in a paper he titled “Radiological Use of Fast Protons.” Even with rapid technological advances, the basic tenets of Wilson’s paper still stand as the fundamental understanding of proton therapy over half a century later. Despite the publication of this groundbreaking paper though, it wouldn’t be until the mid-1950s that proton beams would be used for treatment in humans. The first people to receive proton beam therapy were treated with pituitary irradiation, to control metastatic breast cancer, at Berkley Radiation Laboratory in 1954. In the years following the initial human treatments, more cyclotrons were built to establish proton therapy programs across the United States – Harvard University in 1961, the University of California, Davis in 1964, and the Los Alamos National Laboratory in 1974. The research from these facilities, coupled with the technological advances in photon radiation therapy and its delivery methods, have advanced proton therapy to its current position in the field of cancer treatment today. Proton therapy received U.S. Food and Drug Administration (FDA) approval in 1988. The first hospital-based proton therapy treatment center opened in California in 1991 – operating a modified, more efficient accelerator, called a synchrotron. Proton therapy has been used to treat more than 160,000 people worldwide. By 2030, it is estimated that between 300,000 and 600,000 patients will have received proton therapy treatment. A survey conducted by the National Association for Proton Therapy (NAPT) found the number of centers in the United States offering proton therapy more than doubled from 2012 to 2016 and that the number of patients receiving proton therapy treatment increased by 70% during this period. In the United States, there are 28 active proton centers and 11 centers under construction or in the initial development stages. Even with the rapid growth of proton treatment centers, until recently, proton therapy treatment has been relatively inaccessible for most patients. Some hospitals and oncology treatment centers have struggled to fund the cost of sophisticated particle accelerators, while others have grappled with how to find or construct the space required to house them. Fortunately, a more sophisticated approach to building proton therapy treatment centers has emerged. And facilities considering the incorporation of proton therapy into their treatment options are finding real benefit from pursuing flexible, more affordable synchrotrons. Traditional barriers to providing patient access to proton therapies – cost and space – are both addressed by modern methods of modular construction and affordable treatment delivery systems. The evolution of proton therapy technology has expanded treatment capabilities and made it possible for a greater number of patients to benefit. Today, more than half of all cancer patients receive radiation therapy as part of their treatment plan. As stakeholders continue to refine and improve the delivery and administration of proton therapies, it is set to emerge as a primary radiation treatment option, particularly for inoperable, pediatric, and well-defined cancers. Further, as vanguard treatment systems address historic barriers to entry, more hospitals, and medical facilities will make strategic investments in proton therapies. Learn more about proton therapy. Download our free white paper.